Every relationship needs to recharge, especially our marriage and relationships. And one of the best ways to do that is to dine out and have a date night. If you are running out of ideas, may I introduce you to the many Bacolod restaurants and restobars open to serve you at The Boxes? The Boxes is a strip of Bacolod restaurants and restobars near the New Government Center of Bacolod. There are 52 weeks in a year. 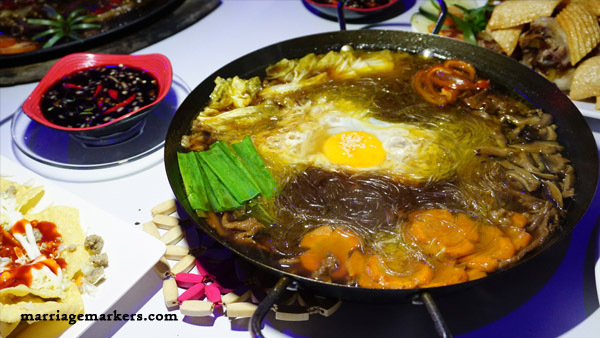 If you eat out once a week and if only there are 52 Bacolod restaurants, then you can try out one restaurant each week so that you can have different fares every week for a year. But while Bacolod business is booming, it is the food industry that is making waves. And because of that, eating out once a week makes it impossible to try out all the Bacolod restaurants that are sprouting like mushrooms all over Bacolod. 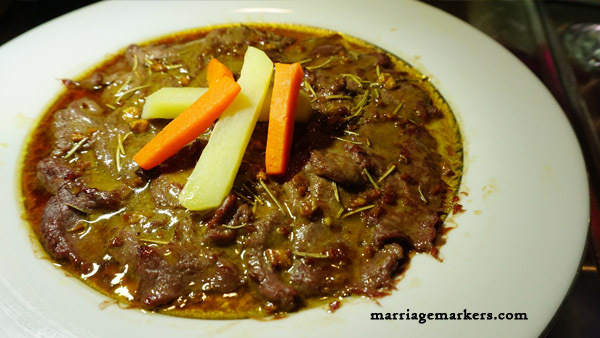 I co-blog with my wife at mamacooks.info. She is Mama Cooks while I am Papa Eats there. So that means I love food so much and try to learn to appreciate what I eat in spite of not knowing how to cook. My wife and I have tried so many restaurants already that she made a list of Bacolod restaurants that we have tried. But that list is not yet extensive that there are a lot more ground that we need to cover. Wifey and I at Yellow Leaf Cuisine. It’s nice to go out on a date from time to time — just the two of us. In fact there is a not so well known foodie haven near the New Government Center of Bacolod. They appear to be just an extension of another food park but actually standing on its own it is like a treasure chest or a box of treasure to be hunted…after all the area is called The Boxes. After reading this, you can scratch off 10 weeks of not knowing where to eat. This guide is just a sample of what they have to offer. I have not tried all there is in their menu. And we were told these are their bestsellers. Should you order these dishes may they give you an idea what to expect on your following visits. If you have tried all The Boxes restaurants, let us know which one is your favorite. I don’t really have a sweet tooth. But there are those times I feel like binge eating on some sweet goodies. There are places I more frequently go to satisfy the craving but mostly for the reason that they are nearer our house. Having discovered Tiffany’s Confections presents another option to indulge the wanting. But Tiffany’s offers more than just sweets and desserts. They also have light meals and snacks that are better appreciated if you are with good company. The Penne pasta is top of my recommendations. But I would probably also try their other dishes, as having tried it encourages me to try other dishes as well for it seems to guarantee the rest of the items on their menu will surely be as good. 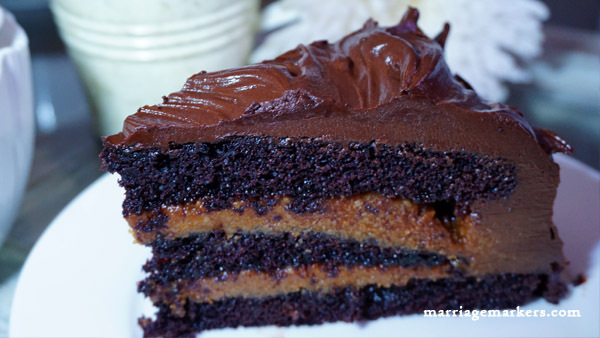 Tiffany’s Confections has a lot of great cakes. I especially like the chocolate caramel crunch. Of course the sweets should be your main target for the visit. My wife and I went there the day before my birthday. We decided there and then that we will go back with the kids and let them enjoy Tiffany’s Confections. The ambiance at Tiffany’s Confections makes you want to linger. But because they also have good food, you will want to go for their other offerings as you stay longer for some chit chat. You may also want to order cakes here for your special occasions or occupy the whole place for a small gathering. I especially like the penne pasta at Tiffany’s Confections. Go there for the ambiance. Go there for the sweets. Go there for the snacks. Go there to be with good company. Go there for all these. Find Tiffany’s Confections in Deck #03 of the Boxes. I am a sucker for spicy food. I am also a sucker for seafood. 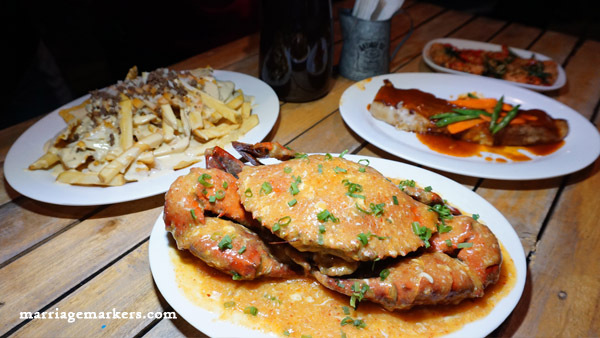 Fafi’s Fusion got both in their trademark dish–the Singapore Chilli Crab. I have heard about the chili crab from my wife. She has stayed in Singapore for a few months before we got married. Because she loves me, she has attempted many times to cook one for me. She is an excellent cook and her version of the chili crab is something I crave for, too. The Singapore Chilli Crab at Fafi’s Fusion is smokin’! But she confesses to me that her version is not exactly authentic. So I guess this is the first time I have officially tried the authentic Singapore chilli crab. And my wife confirms this is the real deal. Now you’ve done it Fafi’s!! I’ll have nightmares if I don’t get to have your chili crab again! Just kidding! Sorry if spicy food or seafood is not your thing. I cannot guarantee you’ll love them the same level I do. But I give this a stamp of approval that my fellow spicy seafood lovers will also enjoy! I have been to Singapore once and also to Indonesia. I loved the food there. I sometimes crave for them while looking forward to going back to any them someday. For the mean time, I know where to go to satisfy my craving. While to me Fafi’s Fusion has been under appreciated, it could be because they are quite hidden in between two establishments that have glaring lights and signage. And for one who is not familiar with them, they appear to be just an extension of one these two Bacolod restaurants. I hope many more will discover them. Or perhaps they can brighten their set up or put up a more attention-getting sign. Well, because of this blog, you will no longer miss them, for now you know that Fafi’s Fusion is in Deck #05 of The Boxes. When you enter Bok’s Restobar, don’t be confused and think you are in a car service center. The owners are just car lovers and this penchant is translated into their decor–including their garage-inspired lavatory. 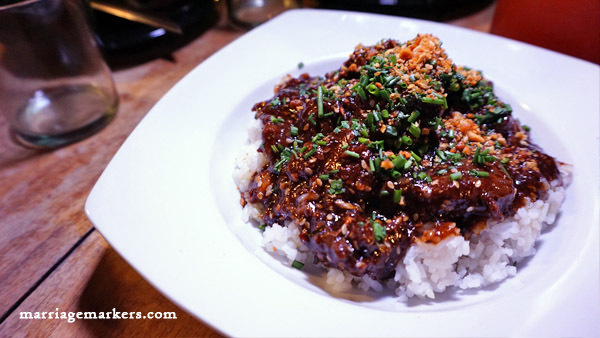 The Mongolian Beef at Bok’s Restobar. And thanks to their creativity, they are able to use junk to decorate their restaurant. But their creativity is not limited to decorating their restaurant only. They have extended their creativity to their food. I recommend their Mongolian Beef dish that has lots of garlic. Order their pica-pica, too. And don’t forget their spiced vinegar. I bought a long-neck bottle for only P180. 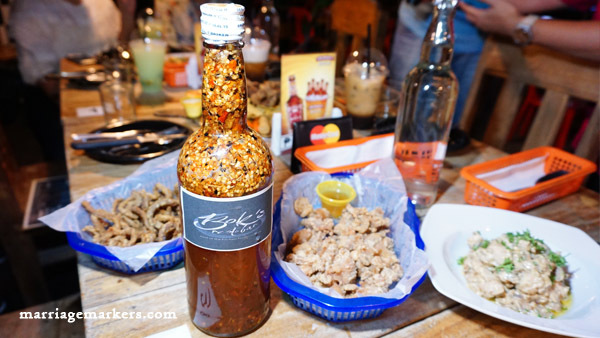 Bok’s Spiced Vinegar and some pulutan. Go to Deck #02 to find Bok’s Restobar. It’s not easy to tell what Yellow Leaf Cuisine serves. To be honest, you would think that house blend tea, or pastries would be their specialty. (That is what was impressed in my mind because I was thinking if there is green tea, there could be yellow tea, too. haha) But the owner narrated that several encounters with yellow leaves was the sign from above that this is the name that she will use for her restaurant. 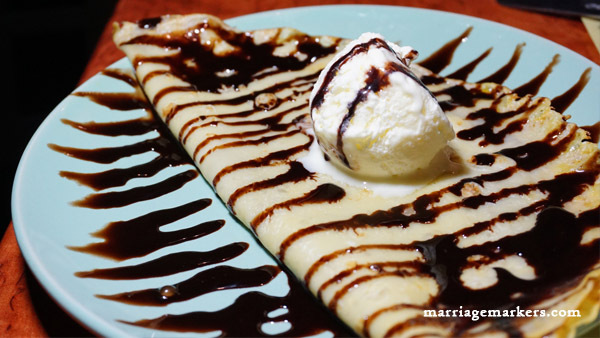 Crepes are available at Yellow Leaf Cuisine. 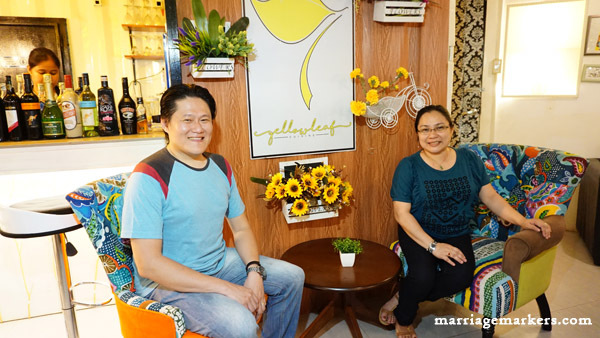 While many Bacolod restaurants do specialize on a certain cuisine, whether it is native dishes, seafood, or grilled offerings, Yellow Leaf Cuisine is more about the creativity of a young culinary arts graduate who enjoys creating novel dishes in the kitchen. Whenever I want to try a resto, I almost always tempted to order salpicao, as I like the dish itself. It is one of those I would say the perfect dish as I like the texture of the beef and its combination to garlic and mushrooms. 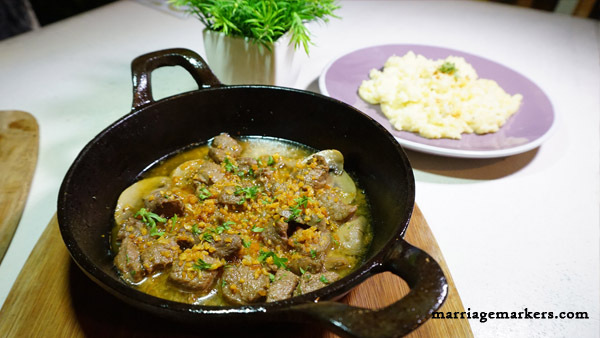 You really have to try the salpicao version of Yellow Leaf Cuisine. But of course every Bacolod restaurant has their own version and have tweaked it to be their customers favorite. I have tried different versions but I vouch that Yellow Leaf is one of those who have perfected the dish. So you must try them on a visit. While of course the food is the most important part of a restaurant, you would want to be a suki (frequent customer) at Yellow Leaf Cuisine for the interior. As you feel comfortable and homey dining there, this makes you enjoy the food more. It will not be easy to miss Yellow Leaf Cuisine, since you only have to go to Deck #01 of The Boxes to find them. Pon’s Restobar is another chill place. It has an open dining area and a small air conditioned area on the second floor for a private function. They have really good food. These are just usual Pinoy dishes but the cooking is really good. Plus, they have a variety of alcoholic and non-alcoholic drink creations that would look great for your Instagram. You would be really satisfied here with your meal and then you can enjoy your happy hour afterwards from a selection of drinks. Pon’s Restobar is located at Deck #11, The Boxes Bacolod Restaurants. 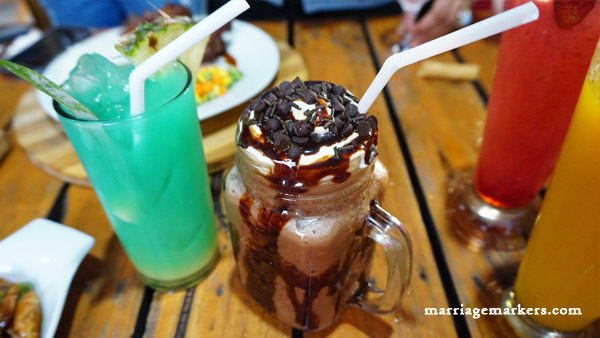 Some of the colorful drinks at Pon’s Restobar. I used to be part of a church choir where I am good friends with some of the members. Sometimes after a practice, we would go out to have dinner and most of the time that would be at Manokan Country where you would find some of the tastiest and juiciest authentic Bacolod Chicken Inasal. 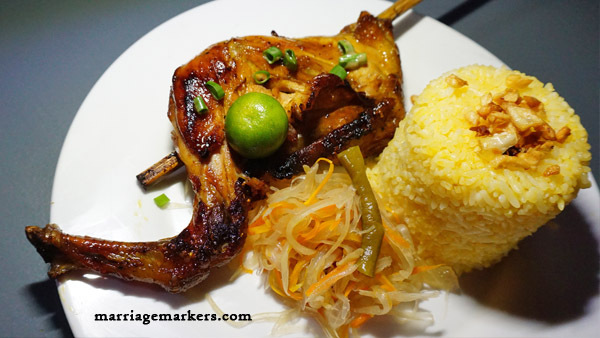 Umbao’s Bacolod Chicken inasal at The Dee Loo Restobar and Grill. One of my friends would vouch for Umbao’s Chicken Inasal since he is a relative. But we would excitedly go with his suggestion anyway because we also liked the taste of their chicken inasal. Lately, I have been confused if the stall is still open because most of the time we pass by, they seem to be closed or their lighting is too dark that it doesn’t look very inviting. I am so happy to know that they have a new place to serve their tasty Bacolod chicken inasal at The Dee Loo Restobar and Grill. 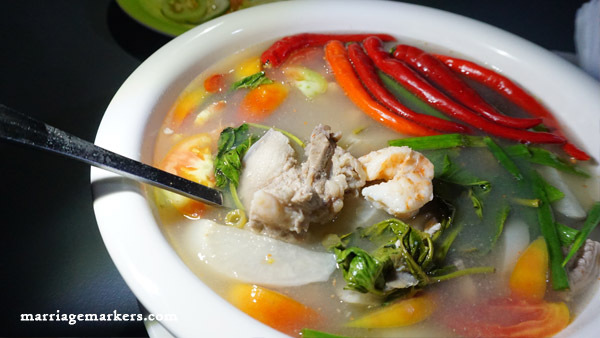 Sinigang Supreme of The Dee Loo Restobar and Grill. But The Dee Loo Restobar and Grill is more than just Bacolod chicken inasal. They call their place The Dee Loo because the owners have a grandchild who call the grandpa “Daddy Lo” (for Daddy Lolo). 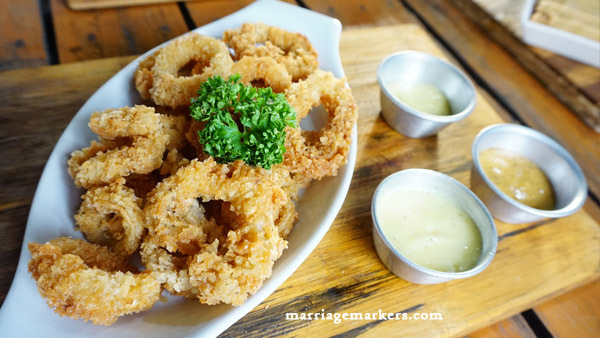 They have lots of tasty meals plus appetizers that are great for pica or for pulutan. 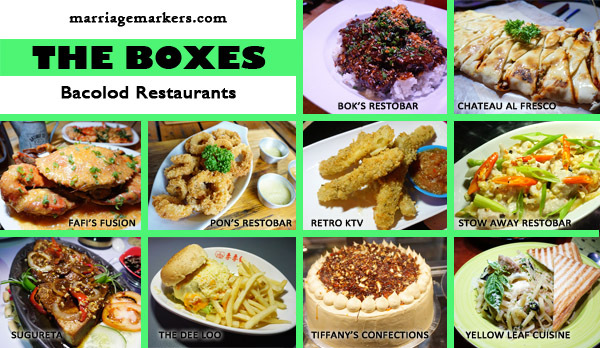 Visit The Dee Loo Restobar and Grill at Deck #12, The Boxes Bacolod restaurants. Sing your heart out at Retro KTV Phenomenon, why don’t you? But actually you don’t have to because it’s more than just a KTV. You can enjoy good eats here, too. My father’s business started with selling vinyl records and making *mixtapes back when duplicating music using tape recorders was not yet called piracy. I grew up in a records bar. When I grew older, I also learned to make my mixtapes. The interior of Retro KTV made me reminisce my years growing up. I don’t know if the present generation can appreciate the interior that way. But I’m sure they will find it fun…and maybe funny, too. Trivia: Mixtape is the equivalent of today’s playlist. It is a a compilation of your favorite songs, typically by different artists, recorded onto a cassette tape or other medium by an individual. My dad used to offer such service in his business. 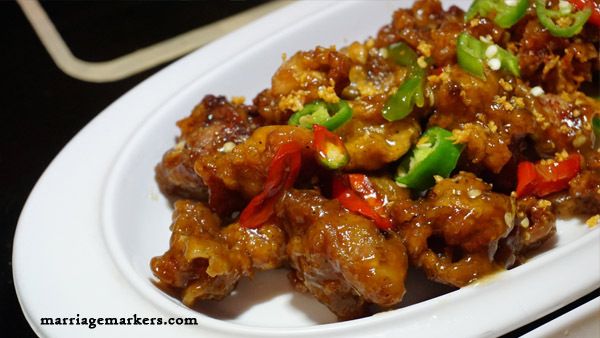 Honey Chicken at Retro KTV. Meanwhile, Retro KTV boasts of a high end karaoke system and they have a collection of many of the most recent popular songs. You will also be amused by the owner’s creativity in naming his drinks and food. There are five KTV rooms of varying capacities to choose from–all with fun interiors. 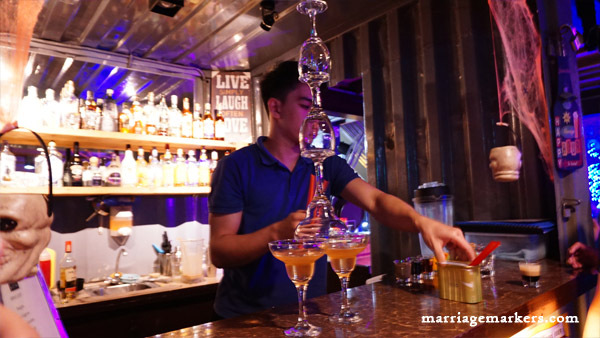 RETRO KTV & BAR would be the flashy joint with an iconic Volkswagen Beetle converted into a barbecue grill at Deck #10 of The Boxes Bacolod restaurants. I sometimes feel I am a confused Korean. I am Chinese by decent. People (even Koreans) mistake me for a Korean. I am a Filipino citizen. But my favorite cuisine I would say would be Japanese. So I would welcome more new Japanese restaurants or food joints here in Bacolod. And it was a treat for me to eat Japanese food on my birthday. The owner of Sugureta Bar and Restaurant must have Japanese bars as inspiration in putting up this joint. They serve Japanese food and they have a female singer for entertainment. Sukiyaki at Sugureta Bar and Restaurant. But aside from Japanese food, they also have Pinoy dishes and lots of pulutan items to choose from. 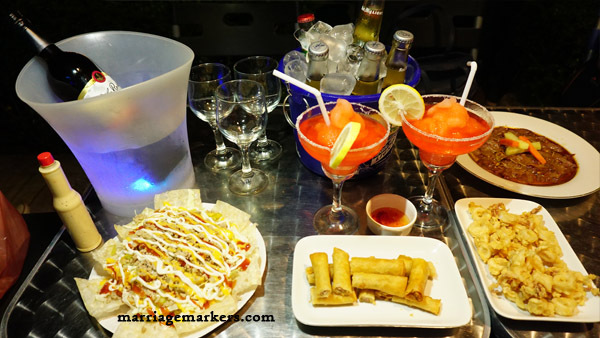 Sugureta Bar and Restaurant is located at Deck #08, The Boxes Bacolod restaurants. A fun thing happened during our visit was it was my birthday and the kids were with us. They were surprised that the band started to sing a birthday song for me that they asked, “How did they know it was your birthday?” Thank you Sugureta and your band for that birthday song you offered! I usually prefer Bacolod restaurants that have a family feel in its set up. Unless I know that the place does serve good to awesome food. If it is my first time to walk around The Boxes, deciding where to eat, I would most likely walk pass Stow Away Restobar. Happy hour at Stow Away Restobar with these good eats — nachos, lumpia frito, and calamares. However, while Stow Away Restobar actually wants to cater to the drinking (I also call it chillin’ crowd) market as this is a bar, only their target customers are most likely the only ones who get to enjoy their food. If you want to enjoy a satisfying meal, you will have to somewhat not mind eating there. Or at least, go there early when it’s still too early to get drunk. Besides, they have an area along the path walk, which is a little bit away from the band. It’s a quieter corner, if that is what you prefer. Filleto steak at Stow Away Restobar. Go for the Beef Steak (this is not bistek but beef served in a sizzling plate covered in garlic and creamy mushroom sauce), the bulalo steak, and Stow Away Steak (filleto) for a meal. if you want pulutan, they have Calamares, Stow Away tapa, lumpia shanghai, and a nachos platter. Their cooking is really good. 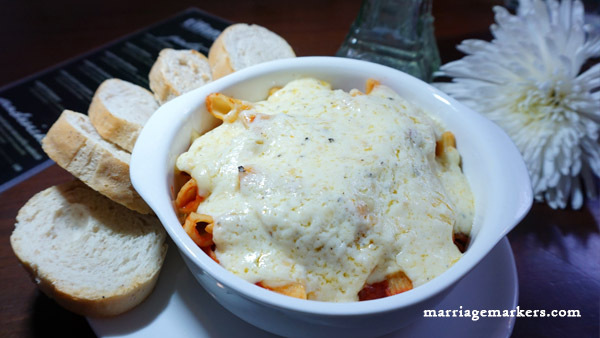 Enjoy food while listening to music at Deck #06 of The Boxes Bacolod Restaurants, where STOW AWAY Restobar is located. Chateau Al Fresco Restobar offers al fresco dining. But they do have a KTV room at the second floor, which you can rent for P1,500 for three hours. The fee is consummable. 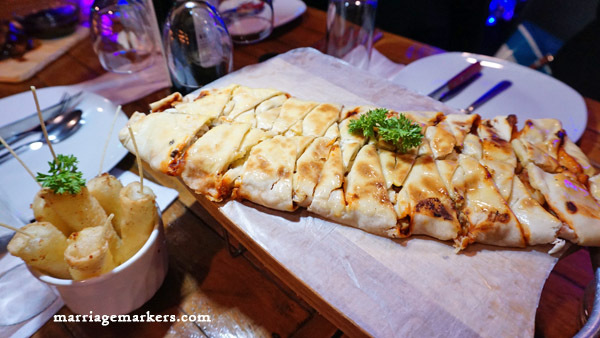 Calzone and mozarella cheese sticks at Chateau Al Fresco Restobar. I specially like their calzone and mozarella cheese sticks. You can have a variety of drinks there, and it is especially exciting to partake of the flaming tower. It is also nice to just sit back and relax at Chateau Al Fresco Restobar because of their live chill music. This is the flaming tower at Chateau Al Fresco Restobar. Chateau Al Fresco restobar can be found at Deck #04 of The Boxes Bacolod Restaurants. And in spite of that long list of Bacolod restaurants at The Boxes, when friends ask us where to eat, we don’t know which one to suggest anymore. My wife and I make a good tandem at dining. It has come to a point that if I eat out with her not around, I sometimes find it hard to appreciate what I am eating. That is why you would usually find us dining out together, whether during date nights or with family and friends.